Denny Hamlin led a race-high 202 of 400 laps in Saturday’s NASCAR Sprint Cup Series regular season finale at Richmond International Raceway, but was forced to pit late for fuel and finished 18th at his hometown track in the #11 FedEx Express Toyota. A late rain shower forced the team into a different strategy than most of the leaders, as Hamlin tried to stretch his fuel to the finish. Eventual winner Clint Bowyer was able to make it the distance, but Hamlin had the dominant car throughout the night. Starting seventh, Hamlin quickly worked through the field and battled Dale Earnhardt Jr. for the lead before the first rain delay brought out the red flag. Following the break, Hamlin continued to lead through a series of green flag pit stops. Another caution for rain came out with 120 laps remaining, and with the team close to its fuel window and ominous skies, crew chief Darian Grubb kept Hamlin on the track in case showers washed out the finish. The rain cleared, however, and Hamlin pitted from the lead for fuel before the green flag, and worked his way up from 16th to second before the final stop with less than 10 laps remaining. 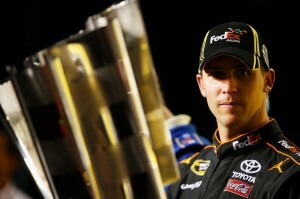 Hamlin enters the Chase as the top seed based on his series-high four victories in the regular season. He is making his seventh-straight Chase appearance this weekend at Chicagoland Speedway.